Oladi are an essential part of the traditional Russian kitchen. 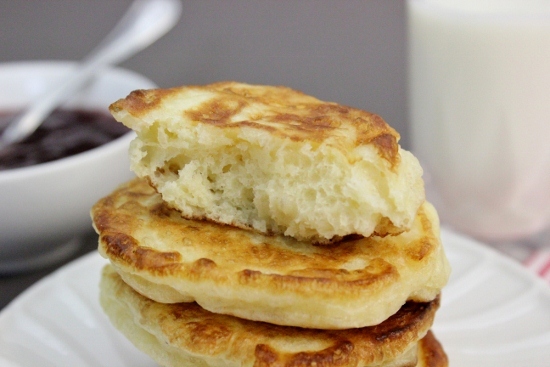 There are two types of Russian pancakes, blini and oladi. 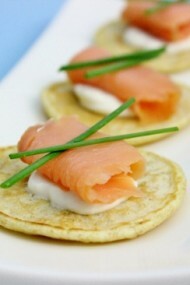 Blini are typically thin, like crepes, and oladi are thick, puffy pancakes. Oladi always bring me back to my childhood, when my Mom would make a huge batch for breakfast and serve them with a sweet sour cream sauce, jam or fresh fruit. My mom would puree some fresh berries with sugar, which keeps the fresh taste of the fruit and is an instant syrup. In the spring, we would pick zemlyanika, wild strawberries, those itty, bitty cute berries that have the most amazing taste. Crouching in the new grass, breathing in the fresh, country air, we would fill our bowls and pails while we muched on the delicate, juicy fruit. We would tuck into the oladi with both cheeks, as the Russians say, “уплетали за обе щеки” (upletali za obe shcheki). Light as a feather, they are delightfully crispy on the outside. The fluffy yeast dough sort of reminds me of yeast doughnuts. 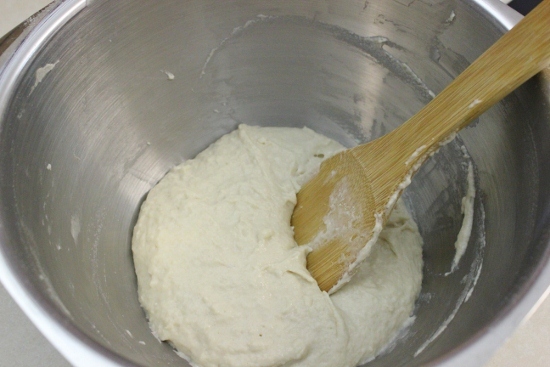 Mix the milk, yeast and flour in a large bowl with a wooden spoon. Cover the bowl with plastic wrap and let rise in a warm place until the dough doubles, 30-50 minutes. I have a heated blanket (I use it even in Florida:), so whenever I make any kind of yeast dough, I wrap up the bowl in the warm blanket, and it rises so quickly and beautifully. If you don’t have this marvelous accessory, preheat the oven to 200 degrees before you start mixing. When the oven is preheated, turn it OFF, and place the bowl with the dough inside. (Of course, use a heatproof bowl, in this case.) It’ll be the perfect temperature for the dough to do it’s magic. The dough will rise in about half an hour. If you just leave it on the counter, it will take longer. 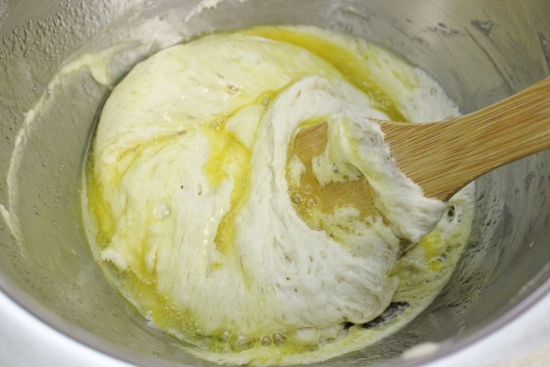 When the dough has doubled in size, add the eggs, oil, sugar and salt. Mix until thoroughly incorporated. Cover and repeat rising time, once again until the dough doubles, another 30 minutes or so. Heat a few Tablespoons of oil in a nonstick skillet on medium heat. Now here I introduce the most wonderful trick to making oladi. Since the dough is VERY sticky, the dough sticks to the spoon mercilessly and you will have a mess on your hands. Fill a mug with water, and dunk your spoon in the water EVERY time you get more dough. Gently scoop the dough, trying not to deflate it as much as possible. The dough doesn’t stick to the spoon and effortlessly slides right off and into the skillet. Absolutely perfect. Cook, until golden on both sides. Drain on a paper towel. Enjoy with sour cream, jam, berries, etc. You can also add apples, berries, chocolate chips or nuts to the oladi. 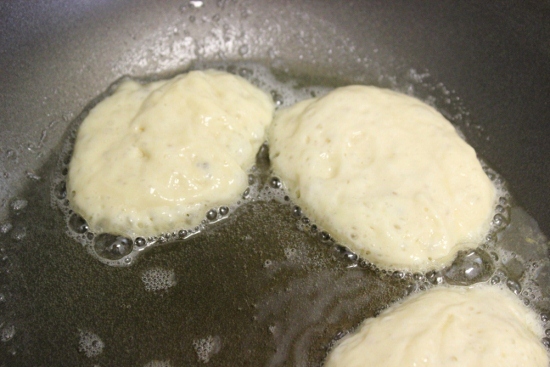 Simply add them to the batter when adding, eggs, oil, sugar and salt. They are a great addition to oladi. One of my favorite variations from my mom are oladi in sweet sour cream. 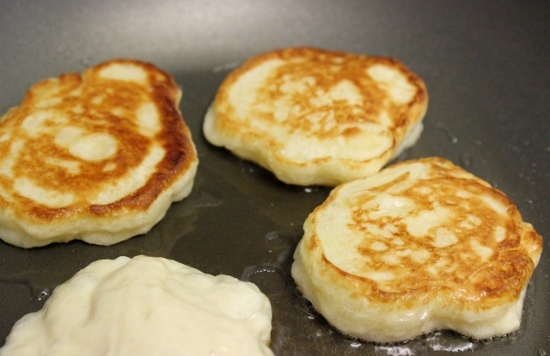 Whisk up sour cream with sugar and vanilla and dunk each pancake in the sour cream. Layer all the oladi in a bowl and the sweet sour cream will seep in to the oladi, making them even more tender and juicy. 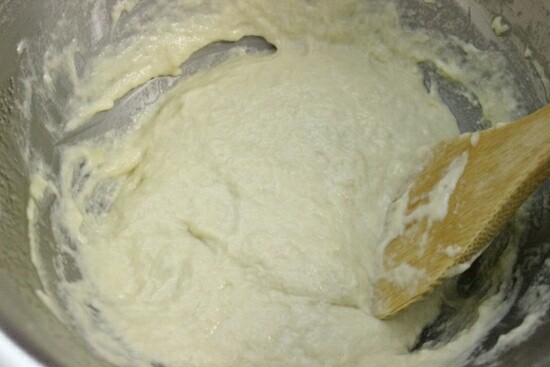 Mix the milk, yeast and flour in a large bowl with a wooden spoon. Cover the bowl with plastic wrap and let rise in a warm place until the dough doubles, 30-50 minutes. 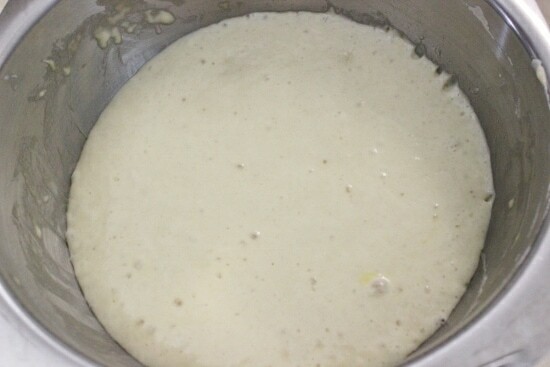 When the dough has doubled in size, add the eggs, oil, sugar and salt. Mix until thoroughly incorporated. Cover and repeat rising time, once again until the dough doubles. Heat a few Tablespoons of oil in a nonstick skillet on medium heat. Since the dough is VERY sticky, the dough sticks to the spoon mercilessly and you will have a mess on your hands. 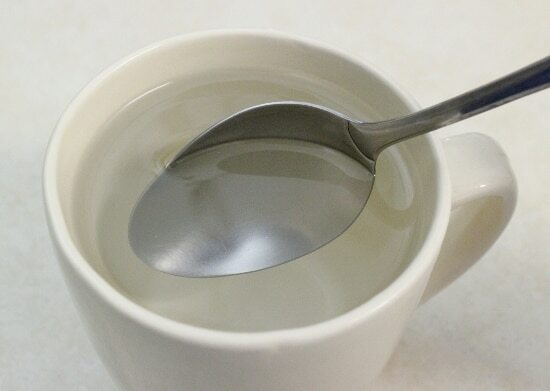 Fill a mug with water, and dunk your spoon in the water EVERY time you get more dough. 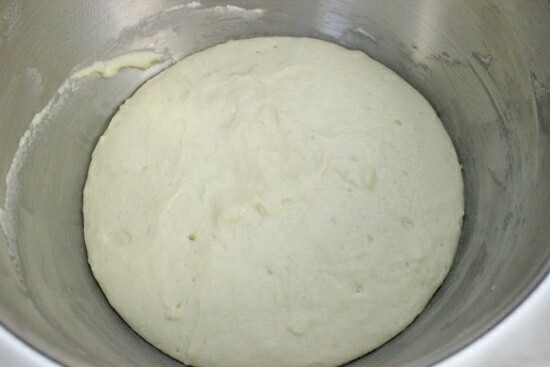 Gently scoop the dough, trying not to deflate it as much as possible. The dough doesn't stick to the spoon and effortlessly slides right off and into the skillet. Cook, until golden on both sides. Drain on a paper towel. Enjoy with sour cream, jam, berries, etc. You can also add apples, berries, chocolate chips or nuts to the oladi. Simply add them to the batter when adding, eggs, oil, sugar and salt. They are a great addition to oladi. 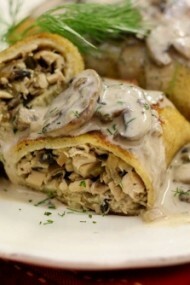 Olya, I am so making these! They look really yummy! You’re a genius- your tip about warm blanket to help dough rise. Thank you!!!!!!! Last week, I was trying to make dinner rolls and I am not kidding you, it took an entire day and they did not turn our good at all. I was frustrated beyond words and started doubting my abilities to work with yeast. But with your encouragement, I am going to try again. Thank you!!!!! You’re welcome, Tanya. Using a warm blanket really speeds up the process and the dough turns out perfectly soft and bubbly. The drops from the spoon don’t cause oil splatter? We recently made ponchiki (zeppoli) and I had a hard time getting off the spoon and into the oil. So this would be great, I am just concerned about having oil fireworks because of the water. Great tips on the blanket and keeping the dough fluffy. Now it makes perfect sense why ponchiki were so dense, we mixed the dough right before frying it. I didn’t have any problems with it at all. Of course don’t use a spoon that’s dripping wet. Besides, when you dip the spoon into the dough, that will take care of most of the water droplets. Thank you Olga! I’m glad that I get to share the recipes that I love with others so they can enjoy them too. I grew up eating these Oladi:). Olya privet, just wanted to say that you do an awesome job!! Sorry, Diana, I’ve never made gingersnap cookies or gingerbread men.I make a lot of different cookies for Christmas too:). Your comment just made me laugh so hard! 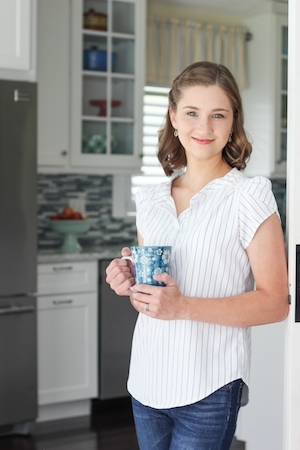 I don’t wake up hours earlier than my husband either, in fact, he usually wakes up earlier. I usually make these oladi on the weekend, when we’re not in a hurry anywhere. Enjoy the breakfast:). About the oladi, they are definitely going into my recipe book, my kids and my husband enjoyed them with sweet sour cream but I enjoyed them the most;) I made half a batch and it was more than enough for four. Thank you for sharing your talent with us, I know it takes lots of time to make up these tutorials, I really appreciate your hard work! I have my eye on these for tomorrow! I’ve made oladi before with buttermilk but since I’m out, I’ll try this recipe. They look so delicious! I made these for breakfast today too:). Brought me back memories of my Mom’s kitchen. On these oladi. Can I use home made kefir instead of milk? And do you have to use yeast? Can I use home made kefir instead of milk for oladi? And do you have to use yeast? For this recipe I always use milk and yeast is definitely necessary. 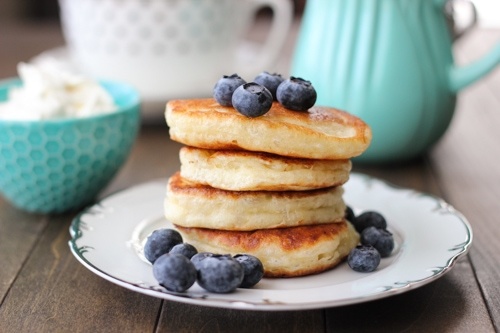 If you are thinking of buttermilk pancakes made with baking powder/baking soda, try out this recipe, Buttermilk Pancakes. Olya I am trying to do oladi by ur recipe right now . When I added 2 cup of milk, yeast and 4 1/2 cup of flour it looked like there was not enough milk! My dough was almost dry and I couldn’t put it together. I had to add 1 extra cup of milk in order for me to mix the dough. Did I do something wrong? I put everything as it says on your recipe. I’m not sure how thick the dough supposed to to be but I’m not giving up lol. I’m still waiting for testo to rise up I hope it all turns out still yummy 🙂 …What is your advice for me? You’re right, it probably was too much flour, Anya V. I was measuring it by weight, so sometimes if you use the cup instead of the scale, the flour is packed in more than it should be. I’ll remeasure it a few times and correct it. Sorry about that:(. Hello Olga, I’m making your recipe right now and yes, like in other commit there is way too much flour, please correct the recipe. Hi Olga, I’m sorry, something wasn’t right, I spent more then 4 hrs in this recipe and they came out wrong, nothing like in the picture. MY first mistake was replacing 1 cup of milk with 1 cup of kefir also in the first rising I suppose to add the flour(which by the way 4 cups were too much), milk and yeast, and i added the sugar by mistake, i let it rise in the warm oven over 45 min and it rises very little, after that i added the rest of the ingredients and left to rise again but it didn’t rise, i used Fleischmann’s rapid rise highly active yeast, but it didnt rise as suppose too, I don’t know if was the sugar or the kefir that didn’t let it rise. They came out very flat and chewy. I was so frustrated that didn’t came out right after spending so much time into it. I hadn’t had these since I was a kid and decided to make them for breakfast today. I modified your recipe and used half the sugar and out of the 3 1/2 cups of flour, 2 were whole wheat. I needed a bit more yeast because WW flour is heavier, but in the end, they were absolutely delicious. 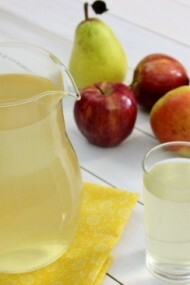 We served them with cottage cheese and apple sauce. Thanks! I’m glad you enjoyed them, Svetlana. Great innovations! Thanks for letting me know, Mariya. I’ll fix it. I just made these and they were the best Oladi that I have ever made!!! They were soooo FLUFFY!!!! And delicious! Oh, yum! Condensed milk? That brings back childhood memories:). Hi Olga! I’m glad I stopped by to your website! You have amazing recipes to look into! I used some of your recipes to make something it turned out great and it was delicious! Thank you for stopping by. Thanks so much for writing. It means a lot to me. Wow, that’s quite a compliment! Thanks for taking the time to write:). The world needs more Olga’s! I am so glad you’ve found your calling. That’s so sweet of you to say, Olga:). The world needs more Olgas! I am so glad you’ve found your calling. I’m so glad this recipe worked out for you, Inga:). Hi Olga! I can’t believe I spent half of the night reading your blog!!! 🙂 (not for the first time by the way…) I really hope I will be able to get up in couple of hours and make these delicious oladi!!! Can’t wait to try them!!! Thank you so much for visiting my blog:). I hope you enjoyed the Oladi. This was a wonderful recipe! I’ve been trying for years to recreate the delicious oladi my host mom in Ukraine used to make and I had always been disappointed until I tried this recipe this morning. Thank you! I look forward to making more of your recipes. Awesome, Annilyn! I’m so happy that you were pleased with the Oladi. We love them for breakfast too:). Olga thank you for this recipe. Heard about your website from many people but just found it yesterday. I am glad I did. I am eating the Oladi now and they are amazing. I added blueberries as well and it is delicious. Do you know if I could prep this the night before and put in the fridge and make in the morning? Thank you so much for stopping by, Yelena. 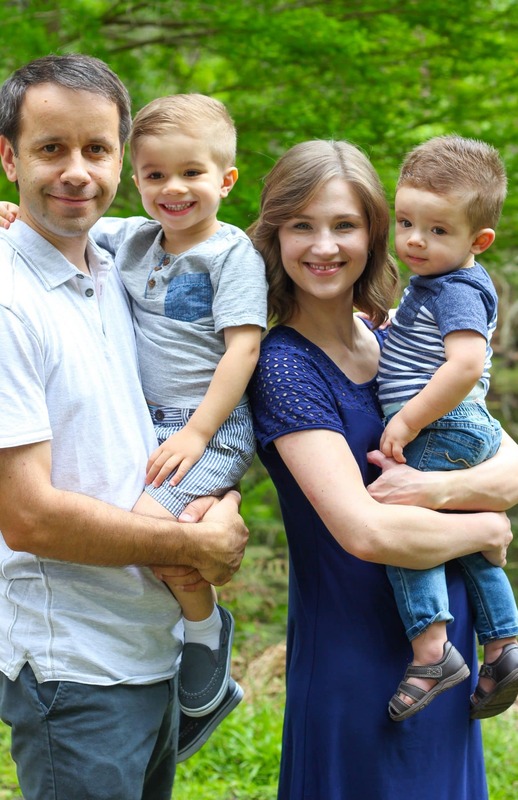 A big “thank you” to whoever told you about my blog. I really appreciate it. 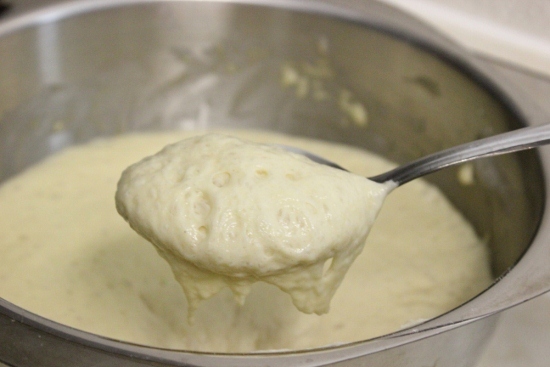 I’ve never tried making the batter the night before, but you can try it out, as long as you refrigerate it. It might taste a little too “yeasty”, but it could also work great. I know there are many recipes for yeasted overnight waffles. Let me know if you experiment. I’ll have to try it myself at some point too. Hi Olga, I don’t know if this question was already answered but what if I prep the dough before bed and make the oladi in the morning. Would they still turn out? Hi Olga, these look super delicious! Do you think I can make the dough the night before and then cook them in the morning? I haven’t tried doing this myself, so I can’t say for sure how well it will work. You could definitely give it a try. The only thing that might be a problem is that the Oldi will taste a bit too “yeasty”, but they just might work well too:). I’ve actually always wanted to try this. Let me know how it works out if you do try it. That would be such a great option. This is a very interesting recipe and I was hoping to find something that reminded me of my mammas oladi but either I did something incorrectly or they are supposed to taste like it but they tasted almost like the belyashi/peroshki dough and just a bit bland. With honey they were pretty good but I do think I did something wrong in the recipe as the dough did not quite turn out to look like it does in the pictures. The egg mixture was hard to mix into the dough and it took at least five minutes of mixing to get it somewhat incorporated. I did add the yeast into the milk before I added it into the flour, would that make a difference in how they would turn out? They did turn out super fluffy though! Like very very fluffy, hence why they reminded me of peroshki. I’m sorry they didn’t meet your expectations. I’m not sure what you were hoping they would taste like, Liana. These are the yeast Oladi that I am familiar with. There are other types, that are made with buttermilk and baking soda/powder, but that is a completely different recipe. I hope you find the Oladi recipe that you will love. 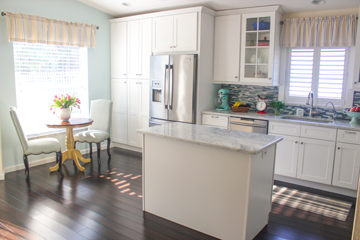 Cooking For Guests This Summer?